Our Auto Detailing and Car Wash Towel Cart w/ Accessory Rack is engineered to make your auto detail or car wash go smooth and quick and keep your detail shop or car wash neater and more organized. 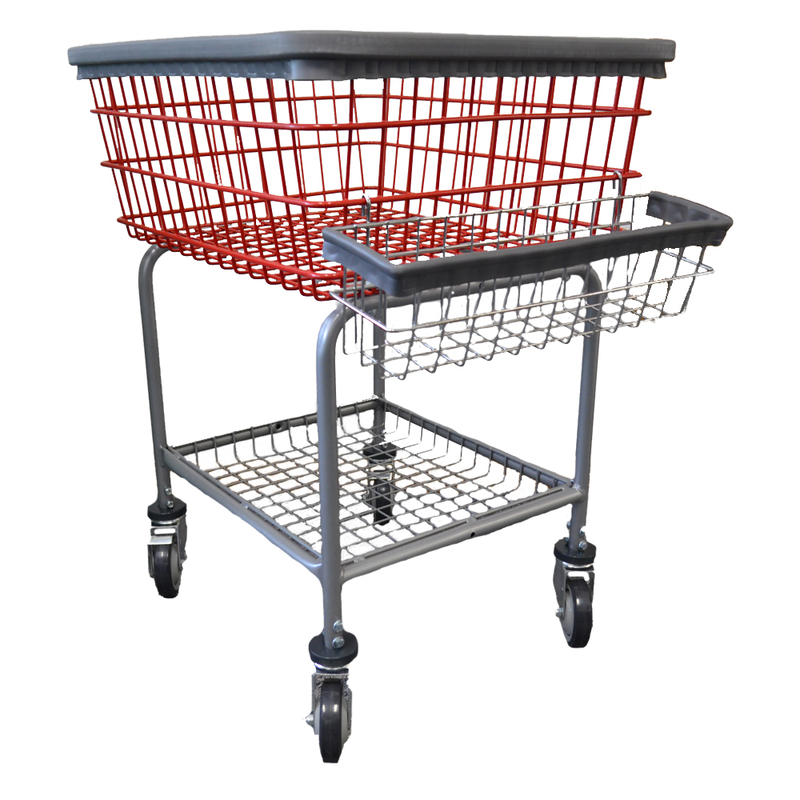 Our Auto Detailing Towel Cart w/ Accessory Rack is constructed using powder-coated heavy steel tubing, polyurethane wheels with locking casters, and has an air-cushioned bumper attached around the lid making it paint safe and ready to rock ‘n roll! The basket is very spacious and able to store your clean microfiber and drying towels. Keep your drying and microfiber towels close by while detailing or washing. 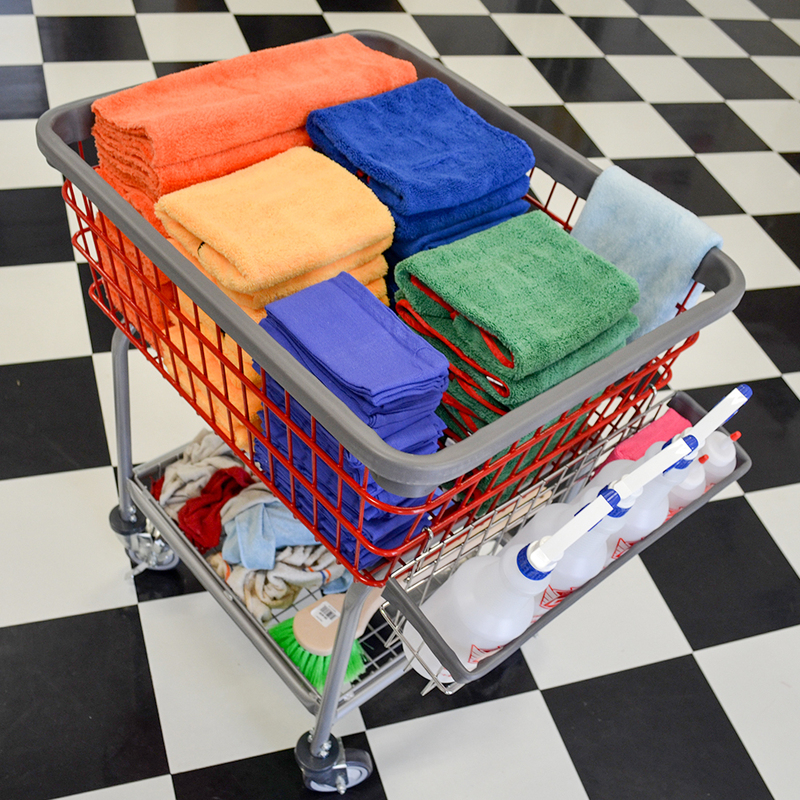 After you are done, toss them all in the Auto Detailing Towel Cart and easily wheel them over to the washer! 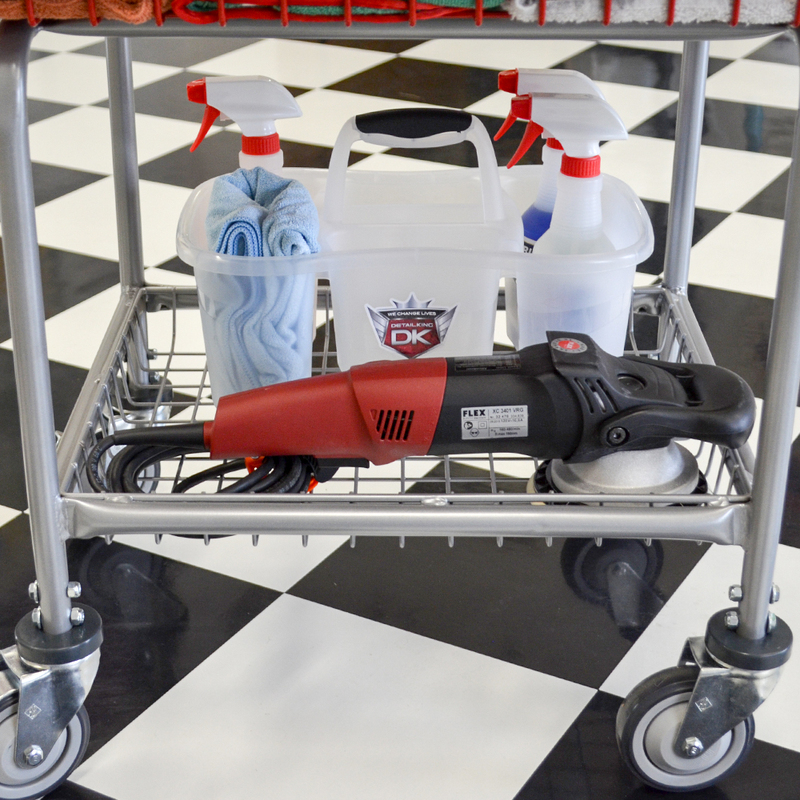 Our Auto Detailing Towel Cart keeps your towels, applicators, sponges and other detailing tools neat and organized. The Chrome accessory rack will hold spray bottles, and just about anything that you need to stow and not end up on the shop floor or car wash pavement. You can choose the BASKET COLOR that best suits your needs, whether it be your company color or for a towel organizational reason. The Accessory Rack will always be Chrome. Our Auto Detailing and Car Wash Towel Cart w/ Accessory Rack is already being used in detailing shops and car washes all across the globe. Car washes have been using this towel cart for years. Now auto detailing shops can take advantage of this really neat and convenient way to keep your clean towels, quart spray bottles, polish squeeze bottles, sponges, aerosol cans and even your dirty towels (stored in lower compartment) all neat and organized and close by when needed. You can even store your polishers on the lower shelf so they are close by if you need them. The air-cushioned bumper that runs along the lip of the Auto Detailing and Car Wash Towel Cart helps prevent dings and dents if the cart does happen to make impact with a vehicle’s surface. 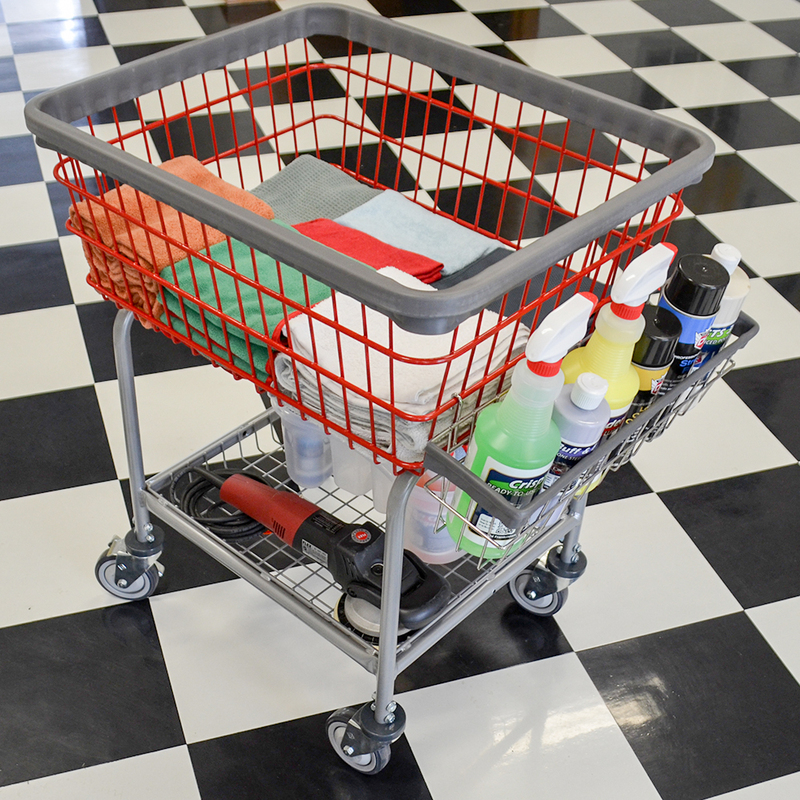 This auto detailing cart is heavy duty, commercial grade and will last for years and years of quality service. If you are a professional auto detailer and has a busy shop or operate a tunnel automatic car wash or hand car wash this is a must item! Some assembly required. This item is NOT eligible for any free shipping offer due to the box size and weight.